Despite a looming New Hampshire presidential primary, there are other things going on in the world that are newsworthy. We are still losing soldiers in Iraq. -- This photo was taken for the Army by Spc. Christa Martin in 2006. 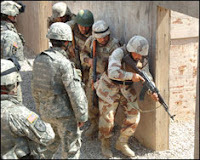 The subject of it is the training Iraqi soldiers, which was the specialty of Army blogger Andy Olmsted, who lost his life on January 3, the day of the Iowa caucuses. He was the first casualty in 2008. UPDATE: Somehow, I thought that given Andy's wish that his death not be politicized, people would refrain from political rants. Most of you have, for which I thank you. Anyone who does not respect his wishes, in this thread, will have his or her comment deleted. The Department of Defense announced the death of Major Olmsted and his companion, Cpt. Thomas J. Casey, 32, of Albuquerque, N.M. in a news release here. Casey's Albuquerque story is in that town's ABQJournal. Casey's wife and children had lived mostly in Reno, Nevada. The DoD website also features a Bloggers' Roundtable. "Chap" at Milblogs posted today about these two military men at the Mudville Gazette. The E-4 Mafia was a group of soldiers deployed in Iraq between January of 2004 and March of 2005. The posts from this period are an expression of our raw emotions and thoughts while serving in Operation Iraqi Freedom II. Since being honorably discharged in the summer of 2005, we've continued to post additional journal entries, poetry, and reflections from our time served and our current lives as veterans as we continue our Fight to Survive. This post is not about politics today, out of my deep respect for the wishes of fellow blogger, Andy Olmsted. It is intended to be about true patriotism, about genuine perspective, and about admiration for beautiful writing. We are poorer for the loss of these two good men. Take some time to read read and explore their stories; I cannot think of a better way to honor and support our military men and women at the beginning of this new year. Terribly heartbreaking. My condolences to the family of Major Andy Olmsted. It is a loss that touches me because it can happen to my daughter, who is currently serving in Iraq (her third deployment). Like any parent, I fear for her and the lives all those serving there. I had a surprise on Christmas Day. My daughter, Captain Jennifer, was on CNN. A video segment called Christmas in Iraq. She is the one wearing the green Christmas pom pom. Hilzoy passes along a suggestion from members of Andrew Olmsted's family: if you want to do something to honor him, consider a donation to a fund to help the children of Thomas Casey, who died in the same ambush.